We were quite hesitant to believe the rumors at first, but there is another rumor now that Apple is going to abandon the yearly release cycle in favor of a six-month release cycle. 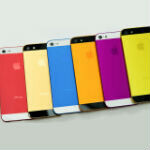 And, the rumored June release of the iPhone 5S also has the handset sporting a number of colorful options. As with many rumors, the information is interesting, but we're not sure just how believable it is, so we'll walk through it. Jefferies & Company analyst Peter Misek is the newest analyst to predict that Apple will move to a six-month release cycle and put out the iPhone 5S in June. According to Misek, the new iPhone will come in a range of 6-8 colors, much like the various iPod colors (the article image is not the official color palette). The iPhone 5S is also said to have NFC integration, a better battery, and a "Super HD camera/screen", although it's unclear exactly what that would mean. Some will undoubtedly speculate that Apple will go for a 1080p display, but we think that's asking too much for a 4" display, and it's more likely that "super HD" just means that Apple will finally cross the 720p standard. Of course, bumping the screen resolution from the current 1136x640 to something over 720p would be an abnormal upgrade for an iPhone "S" model. Neither the 3s or 4S bumped the screen resolution, because the "S" models have traditionally been more about performance bumps, and internal specs rather than external feature increases. We're going to mark say a camera upgrade is believable, but the screen upgrade seems somewhat unlikely, until we find out more about the iOS schedule (more on that later). The new color options and NFC seem like much more realistic options for the iPhone 5S. Colors are an easy and inexpensive way for Apple to make the iPhone line more "diverse", just like it did with the iPod line when sales were flagging there. And, NFC also makes some sense. NFC is more of an "S" model upgrade for Apple, meaning it's interesting for some, but won't anger those who bought the iPhone 5 a few months before. As we've said, the NFC infrastructure hasn't been built out enough, but Apple's adoption will at least bring more visibility to it given the standard media hype that surrounds an iPhone release. No rumor roundup is complete without considering why Apple would do this, because the why of it is the most important part in determining if we should expect to see a new iPhone in June or in September. The prevailing theory seems to be that Apple doesn't like how much ground it is losing to Android in the market, and is looking to boost sales with a faster release schedule, rather than waiting out the inevitable lull in sales that comes in the months before the current yearly release. We covered the other side of that theory not too long ago, which states that by pushing to a six-month release cycle, Apple is moving away from the thing that makes the company successful. With a yearly release, there is a lull in sales in the lead-up to the new iPhone, but those months are also the most profitable time for Apple, because the iPhone is still selling at the same price, but costs less to build. By releasing the iPhone on a shorter cycle, Apple avoids that lull in sales, but also reduces its profit margins in the process. There is some evidence that Apple will move to a six-month release cycle for the iPhone, because the company did just release the iPad 4 about 7 months after the release of the new iPad. Of course, the hardware upgrades are really the less interesting part of the equation here. What we're really interested to see is what happens to the iOS release cycle, because the software has never really been a part of the rumors about a faster release cycle. Apple's pattern has been to announce the new iOS update at WWDC in June, and release the update in the fall with the new hardware. It seems unlikely that Apple would move to a six-month release cycle on software as well, because it takes the company so long to add any new features to the software, but the extra marketing punch that came with a simultaneous release of the new hardware and software had value for Apple. If the company sticks to a yearly release for iOS, that would mean that would mean that the hardware upgrade alone would have to carry the marketing for the iPhone 5S. NFC and new colors make for flashy marketing, but they don't make for great reasons to buy a new phone, so that would make a screen upgrade more likely (we promised to get back to that). That said, now that Jony Ive is in charge of iOS design, the traditional cycles that we have seen may not mean much. We should know more soon enough though, because Apple does like to try topping all of the Android buzz that comes from CES by having stories leak just after the conference ends. Apple does this (multiple colors and 6 month releases) and you will see huge increases in iPhone sales. So I hope they don't lol. actually you may not considering that most contracts last 2 years. you may see some movement but again it all depends on the product as well. Resell previous model on Craigslist or eBay. Easily cover the cost to bringing it down to subsidized cost. iPhones lose their value very very slowly. My friend's been waiting 4 the iPhone 5, but she's gonna get crushed I'd she heard this rumor!!! apple now realize that the black and white are getting boring! even HTC realize that! they are nokia troll! they like nokia's colorful designs... realisng the iPod touch 5 with colorful nature just prove that maybe the next iPhone will be colorful as well! The image isn't official, that's just something I pulled from AnoStyle. I'll make a note of that. Great article Michael! Very informative and well thought keep up the great work! No it dosen't, the white and purple looks very distinct! Yet again nice article Micheal. H! How become you're doing Apple editorial? Looks like, hope to see 60+ posts.....! If they start releasing versions at that interval, the following will be required: 1. decrease in phone price 2. completely redone interface A bag of dogshit is still a bag of dogshit even if you can color in the bag. What a accurate reference with the dog poop. All that power to run a crappy OS. Better be something more processor intensive. since everyone is going 5", apple 5s would be a 4.4" screen. No way. It took til the 6th iteration for them to increase the screen size. No chance it's gonna happen again in the 7th. Agreed. The jump from 3.5 to 4 was a big take for Apple. I don't see a 4.5" or larger as many may think. As for the colors it doesn't really matter to me. I have a white iPhone 5 and Galaxy Note. Colors are mute because of some cases. they basically realised that they are behind, so they need to release few iPhones to catch up. they need to get to at least iPhone 7 so that is why quick releases. wow. colours. revolutionary, magical, this changes everything again. Yea this changes colours, following xeroxing Nokia! what about Ericsson ga 928 I think it was. one of the very first mobile phones. brick with antenna. you could have change the covers in different colors. Nokia may not have been the only phone company releasing different colors for each model, yes we all know that. But the thing is, Nokia IS the only company (at least, in recent times) that did release vibrantly colored phones while the crowd is releasing black/white/silver-colored phones. And to add to that, if Apple were Nokia and were the first to release vibrant color options for their iPhone and Nokia planned to release one, then I have all the reasons to believe that Apple will sue Nokia over that. After all, rounded rectangles are patentable, right? Honestly, I don't think there is a need for Apple to release those uber-colorful iPhone options. I've noticed that some buy the iPhone not just it being among the most sought-after device but because people that buy those, in some way, think of it as a fashion accessory that compliments their style. Of course, who's to say that a colorful phone cannot be called a fashion accessory? But certainly, most iPhone users that I know think of Nokia phones as toys largely because of those colorful chassis and love to flaunt how metallic and how much more "professional and serious-looking" their iPhone is. Colorful phones worked for Nokia because Nokia users tend to change the back covers and/or casing of their Nokia phones all the way back in the days of the 3310. Nokia knew that its loyalists likes colorful chassis so they gave users different colorful options. I don't know how things will work for the iPhone. Interesting space to watch. Lets be real - & Im not that big of an Apple hater - but those colors are ugly.